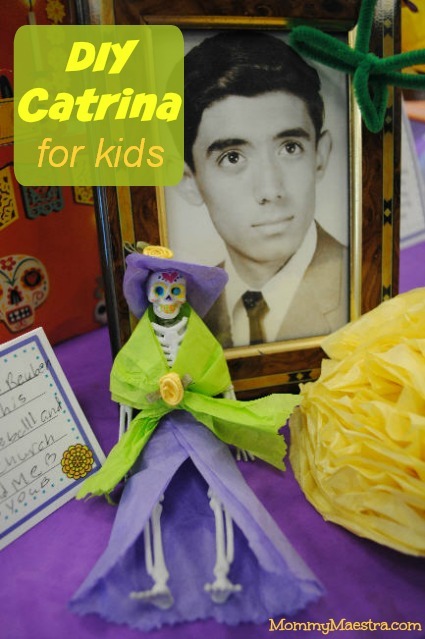 I spent a while researching online for ways for kids to create their own Catrinas. I finally gave up and we winged it. Fortunately, we're delighted with the results! This whole project was relatively simple with lots of little steps, but it is a great way to let your creativity bloom. 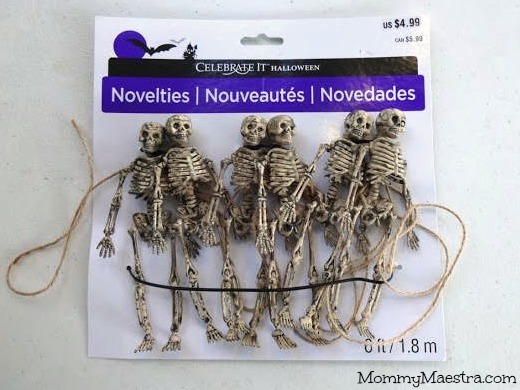 We found this skeleton garland in the Halloween section of our local Michael's craft store. They were the perfect size, so we just removed them from the garland. 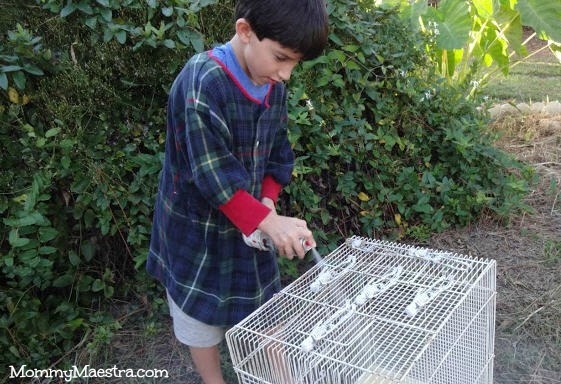 But they were a bit too dark and scary looking for us, so we spray painted them white with fast-drying paint. Next, my kids hand painted the skull. I like the soy color palette best, plus the soy paints seem to last a little longer. While your paint dries, decide on a color scheme for your Catrina's outfit. We went with lime and lavender for one and gold and pale blue for another. For the hat, fold the tissue paper so that you have two layers and cut a rectangular piece that is wide enough to stick off the sides of the skull a good ways in all directions. Don't worry, it doesn't have to be exactly perfect. Having too much is better than having too little, because you'll be trimming it down with scissors anyway. For the shawl, cut another two-layer strip that is long and skinny. It needs to be long enough to wrap around the shoulders and overlap in the front of the Catrina. For the skirt, cut a (two-layer) wedge strip. The top should be wide enough so that it can encircle the waist easily. I recommend the fold be at the top to help hold the two pieces together. The bottom should be much wider for a full skirt, or about the same as the top for a pencil skirt. It should be longer than your Catrina's legs so that you can trim in back once it is attached at the waist. Now you're ready to attach the hat. First, smear some glue all over the top of the skull and down the sides/back just a bit. Then attach the tissue hat pieces. Place the skull right in the middle and mold the tissue paper around the skull. You'll probably have to hold the tissue in place for just a few minutes while the glue dries. When it is secure, use scissors to round the edges to create your circular brim. Now we can attach the shawl. 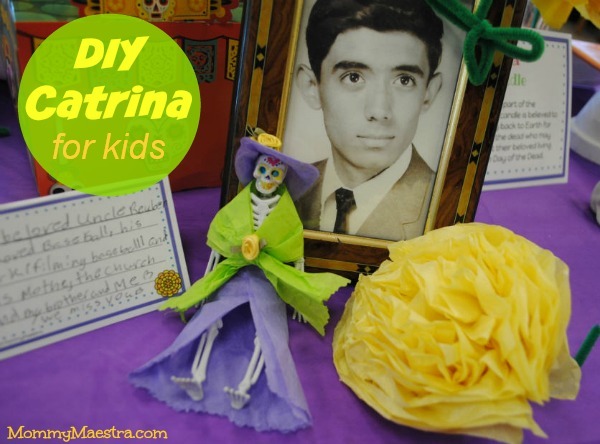 Wrap your long skinny piece of tissue paper around the shoulders of your Catrina and bring the ends down toward her waist. Pinch one strip together at the waist and twist. Do the same with the other side and crisscross the two at the twist adding a drop of glue to hold them in place. Let the glue dry. Next, you'll want to add your skirt. Wrap the top layer around your Catrina's waist, then overlap and glue the top edges. Our Catrina had a slit in her skirt and we liked the way it looked. So we just trimmed the bottom edges with our decorative scissors. 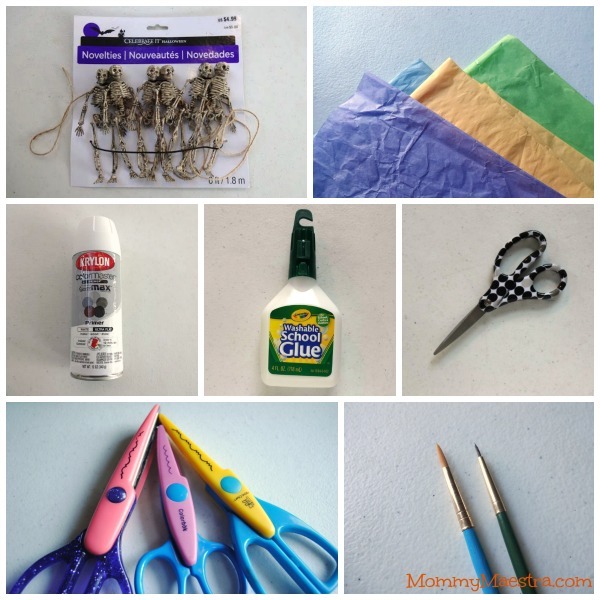 You can use regular scissors, or simply tear the edges for a more frayed look, too. Finally, once the glue on all your tissue paper clothing has dried and you're satisfied with how it looks, you can glue some decorative accents. We used small fabric flowers (found in the sewing section of your local craft store) to decorate the hat and the shawl. Let the glue dry. And you're done! Your Catrina is now ready to be added to your ofrenda. How pretty is she?